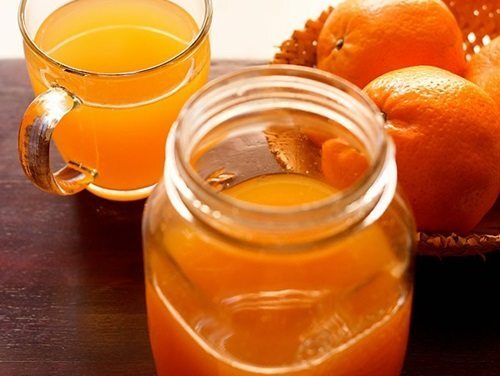 orange squash recipe - do it yourself homemade orange squash made from fresh oranges. orange squash recipe with step by step photos – a preserved fruit drink recipe for the first time on the blog. this orange squash recipe is for all those folks like me, who prefer to prepare everything from scratch and are a DIY person. this is a really good orange squash. its much better than the store brought ones. orange juice made in a mixer or blender. apart from this, this year i also made khus syrup and sandalwood sherbet. both these drinks are very cooling and best for beating summer heat. the orange squash was made with a sweet variety of local oranges called as kinnow or kinnoo in india. these are juicy oranges. 2.25 kgs oranges yielded 2.25 litres orange squash. i got a total of 5 cups + 3 tbsp orange juice which is approx 1.25 litres. isn’t that good. this is not sugar free recipe. 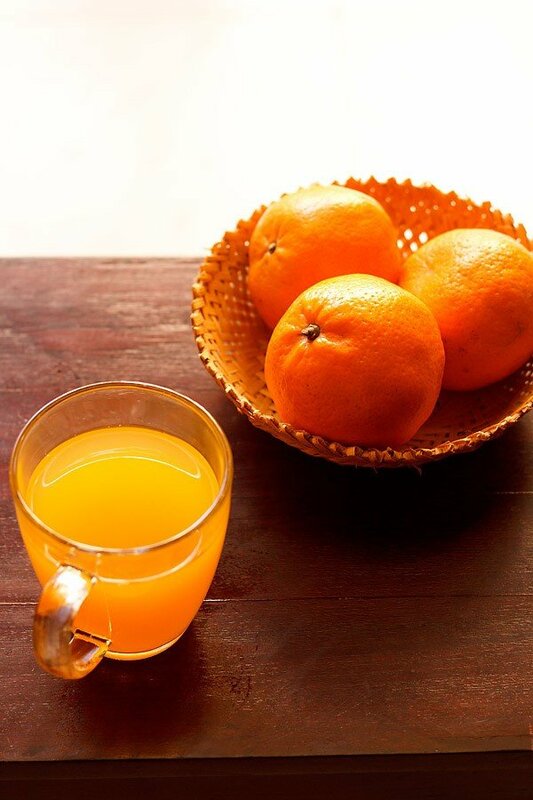 if the oranges are too sweet, the quantity of the sugar can be reduced. i have used organic unrefined cane sugar instead of regular refined sugar. please note the squash can be made with evaporated cane sugar too. however, the taste will be slightly different. i also added some saffron to the orange squash, but its entirely optional. 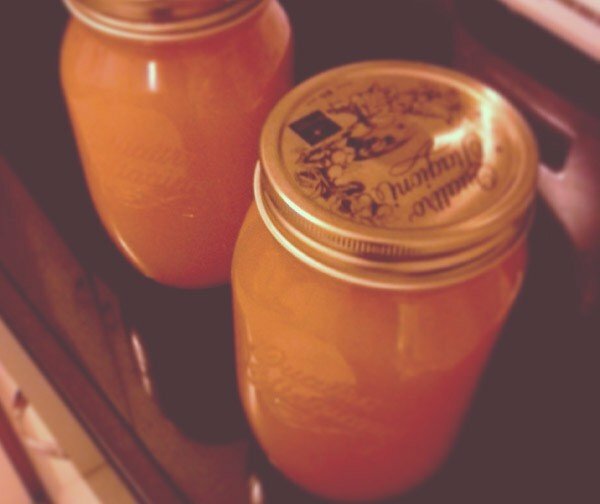 i sterilized the canning jars. 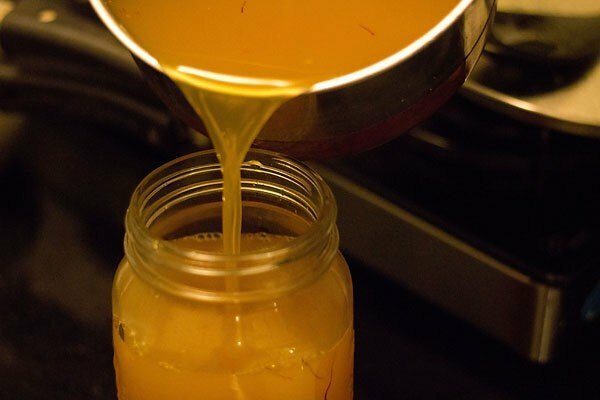 i have mentioned the method of sterilizing the jars or bottles in the recipe details below. please use a good quality glass jar or bottle, so that it does not crack or break during the heating process. 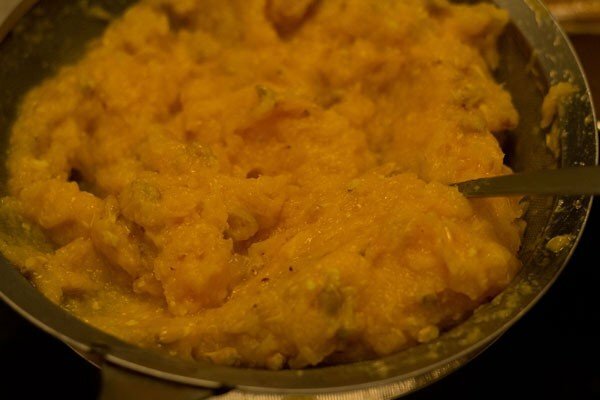 in the squash, i have added a preservative – potassium metabisulphite. the reason being i did not want the squash to get spoiled. 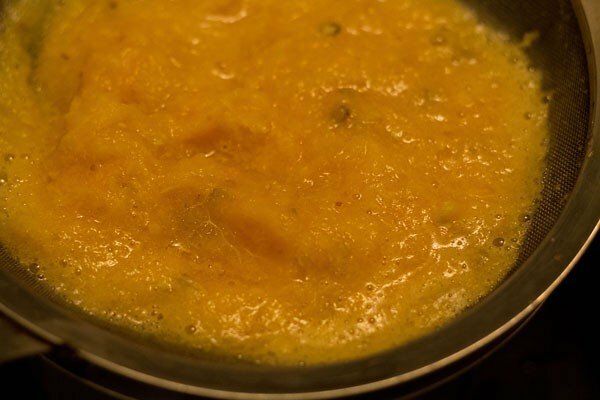 last year i had made mango squash without a preservative and within three days the squash got spoiled. we are still having the orange squash and its still good after 2 weeks. for making the orange squash, i referred to my home science notes. i have taken extensive step by step pics of the preparation of orange squash. made it during the night and hence the pics have a tungsten glow on them. first begin making the sugar syrup. 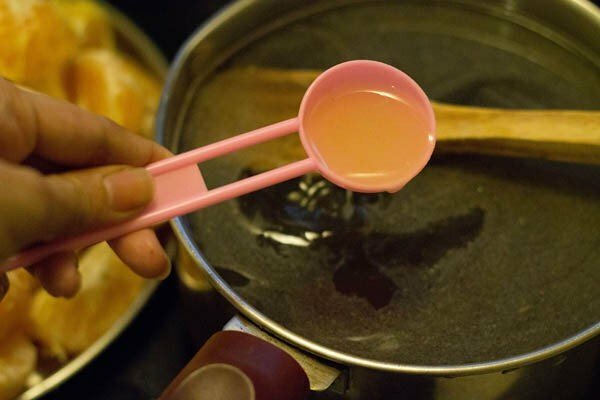 dissolve the sugar in water in a large saucepan or pot. add lemon juice and stir. let the sugar solution come to a boil. lower the flame and simmer for 4 to 5 minutes till the sugar solution thickens a bit. you don't need any thread consistency. just a slightly thick and sticky flowing sugar solution. remove from the pan and let the solution become warm. filter the sugar solution to remove the impurities. let the sugar solution cool at room temperature. crush saffron threads and add them to the warm sugar solution. this is an optional step. whilst the sugar solution is cooling, you sterilize the bottles and start making the orange juice. in a large pot, bring enough water to a boil so that your canning jar or bottle gets completely immersed in it. place the glass jar in it and its lid separately in the hot water. continue to boil for further 8 to 10 minutes. with the help of canning tongs or regular clean tongs, remove the jar and the lid and keep aside. next, peel and chop the oranges. 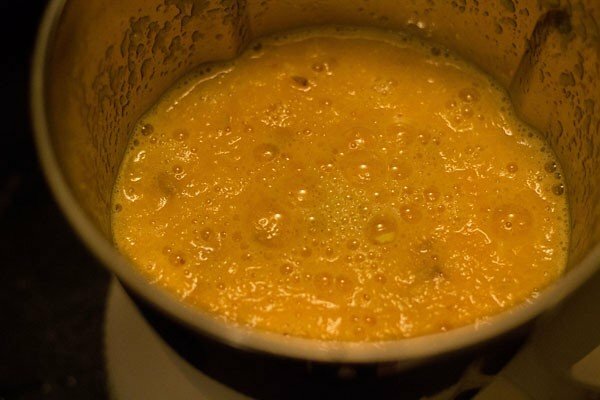 in a blender, add 1/3 or 1/2 of the oranges or as much as the capacity of your blender is. keep on pulsing for some seconds till the oranges have been crushed very well. then strain the orange juice through a juice strainer. press the pulp with a spoon so that all the juice is strained away. 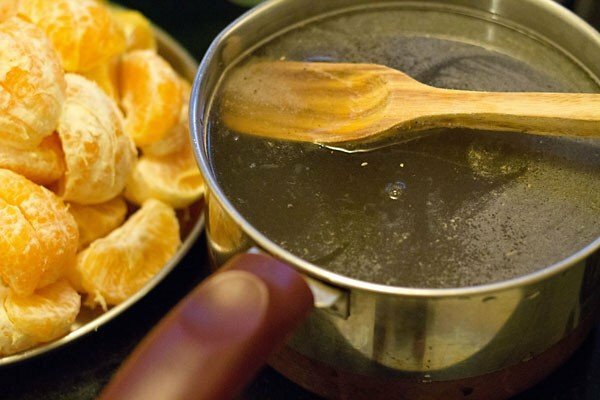 add the strained orange juice to the sugar syrup and stir. 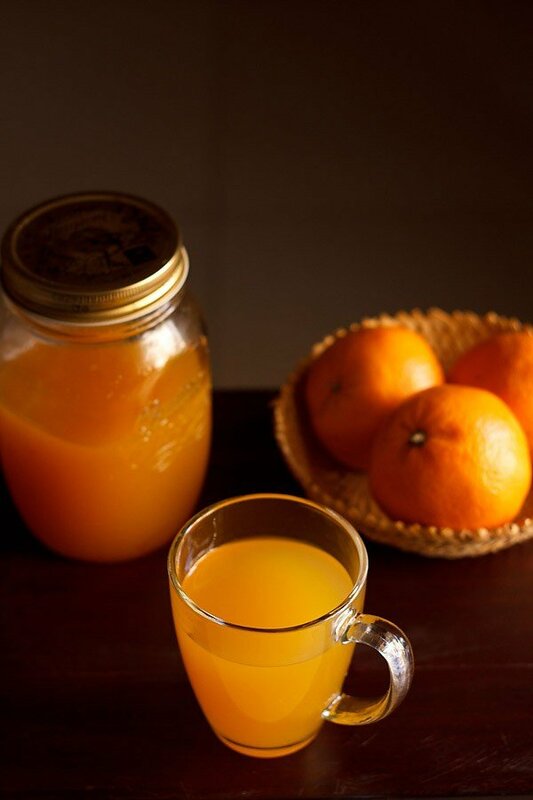 we need to add the orange juice immediately, so that it does not become bitter. now work again juicing the oranges in batches and then adding them to the sugar syrup. you can also use an electric juicer to juice the oranges. take 1/4 cup of the orange squash in a cup or bowl. stir in the potassium metabisulphite very well so that it is completely dissolved in the water. add this preservative solution to the orange squash. stir again very well. pour the orange squash in the sterilized jars or bottles. close tightly with its lid and let is stay for some hours, about 3-4 hours outside at room temperature. later refrigerate the orange squash jars or bottles. let the orange squash sit for some days (about 3 to 4 days or a week) in the fridge and then you serve. the flavors improve after some days. shake the jar or bottle before you use the orange squash. for serving, stir 1/4 to 1/3 part of the orange squash with 3/4 or 2/3 parts of cold water or regular water. add ice cubes if required and you can garnish with mint leaves or lemon slices. serve the orange drink immediately. 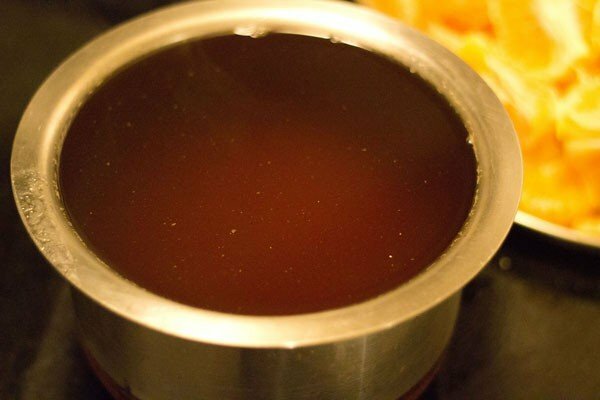 1. dissolve the sugar in water in a large sauce pan. add lemon juice. 2. stir and then keep the sauce pan on the stove top. 3. let the whole mixture come to a boil. then simmer for 6 to 7 minutes on a low flame. the sugar solution need not have any thread consistency. just need to be slightly on the thicker side yet flowing. you can see the consistency in the pics. when you touch it, you should feel a stickiness. thats it. 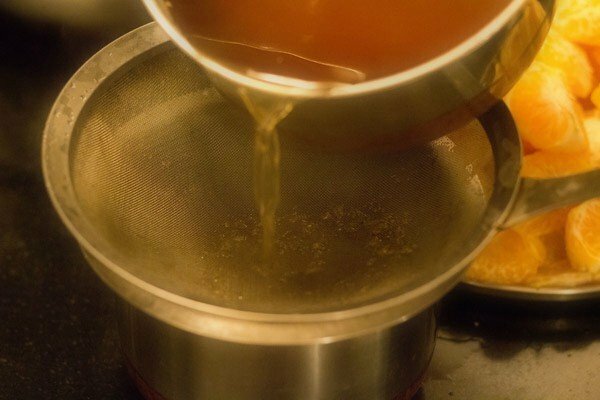 4. once done, strain the sugar solution to remove the impurities. 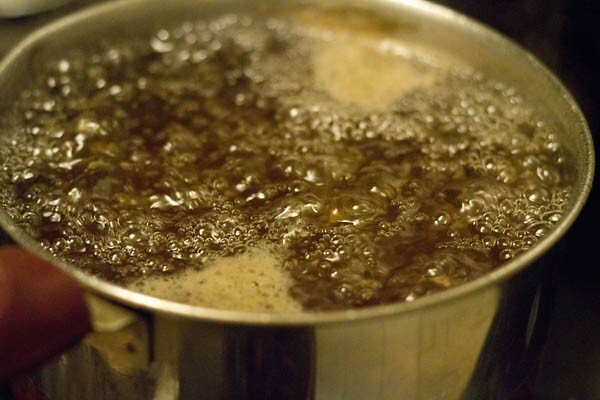 5. below is the strained dark sugar solution. the color is dark as i have used unrefined cane sugar. let the sugar solution cool at room temperature. 6. peel the oranges. you can roughly chop them, if you want. add half of the quantity to the blender and pulse for some seconds till the oranges have crushed very well. 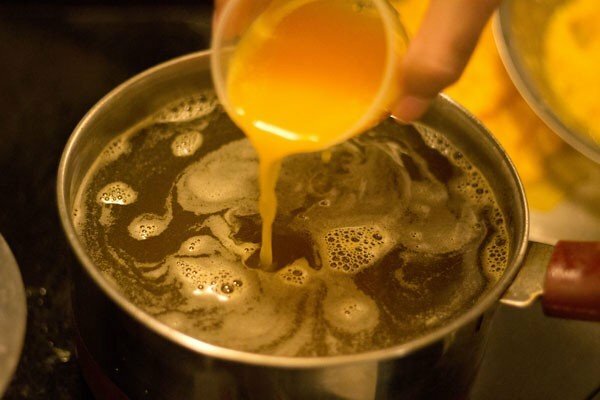 7. strain the orange juice through a juice strainer. 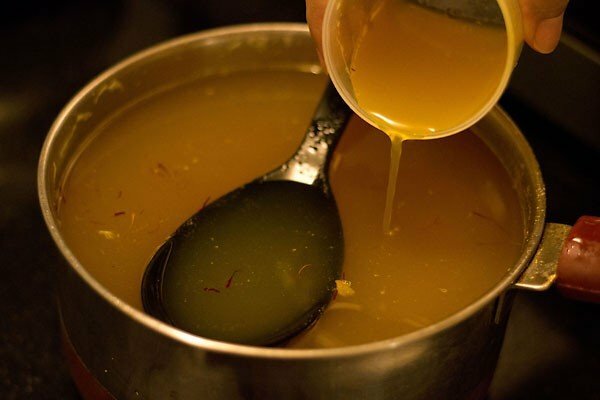 8. with the help of a spoon, press the pulp so that all the juice is strained away. this is an important step. you can also use an electric juice to juice the oranges. 9. immediately add the orange juice to the sugar solution. this is done so that the juice does not become bitter. work similarly with the second batch of oranges. you can also use an electric juicer to juice the oranges. 10. take ¼ cup of the orange squash. add the potassium metabisulphite and stir well, till its completely dissolved. 11. add the preservative solution to the orange squash and stir very well. 12. pour the orange squash into prepared sterilized bottles or jars till the neck. 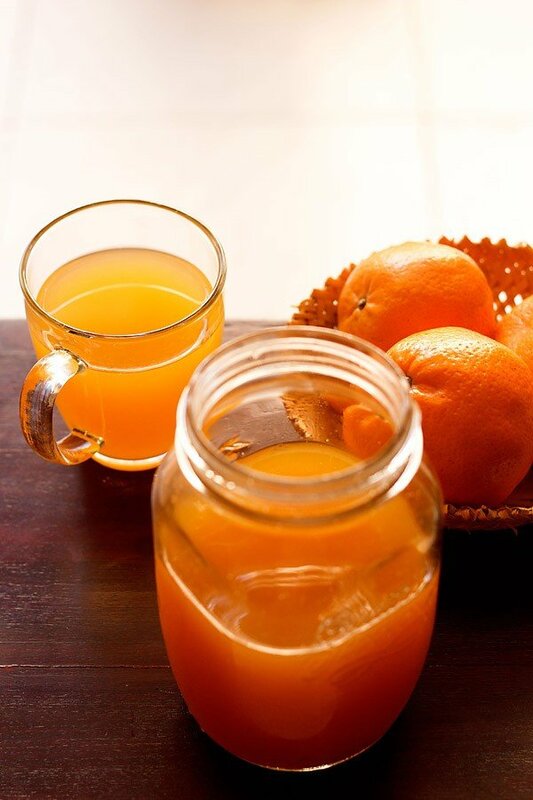 13. close tightly and keep the orange squash in the fridge for some 3 to 4 days or even a week. the flavors become better after some days. 14. for serving, dissolve 1/4 part of orange squash with 3/4 parts of chilled or water at room temperature. you can garnish the orange drink with mint leaves, lemon slices or orange slices. serve the orange drink immediately. Hi, your recipes are all super good. 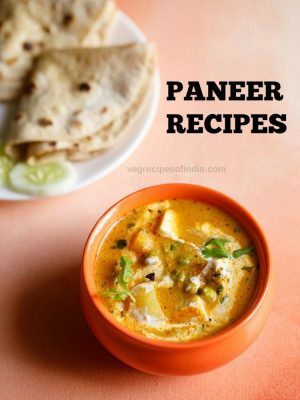 I have experimented many of your recipes and all have come out well. Whenever I have to prepare something different I browse through your site. I am thinking of preparing pomegranate squash. But without preservative. If I add only lemon juice, will the squash stay in fridge for a week? thanks a lot nitha. with only lemon juice, the pomegranate squash can easily stay for a week in the fridge. Thanks a lot Dassana Amit. 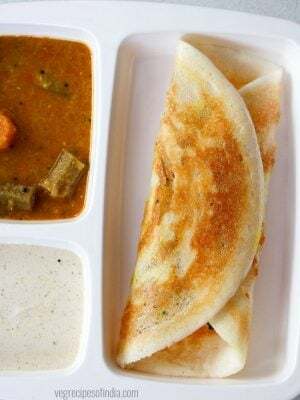 Expecting more continental recipes from you. will try to add some more. 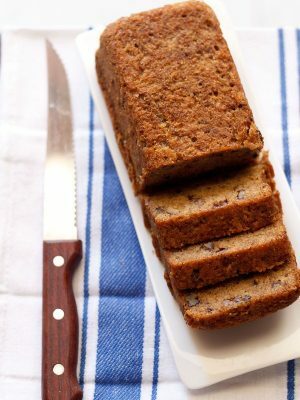 Hi Dassana Amit, I have baked eggless banana cake, apple cake, butter Cooke’s, chocolate cookies, etc from your recipes. Also mango cake by referring to apple cake recipe. All came out good. The pomegranate juice was a hit. I added only lemon juice. Also I replaced saffron with a half beetroot juice and cloves for a flavour. It was awesome and stayed good till today, until its finished. Welcome Nitha. Glad to know that you tried many recipes from the blog and they all came out well. Thanks for sharing your feedback. Hi. You seem to know a bit about preservatives. Would like to know if diluting juice when mixed with water has enough in it to prevent fermentation? i would not suggest diluting juice with water. it can spoil the squash. What preservative do you make use of and if not stored interested the refrigerator, won’t it damage? if preservative is not added the squash will get spoiled. the squash has to be refrigerated. 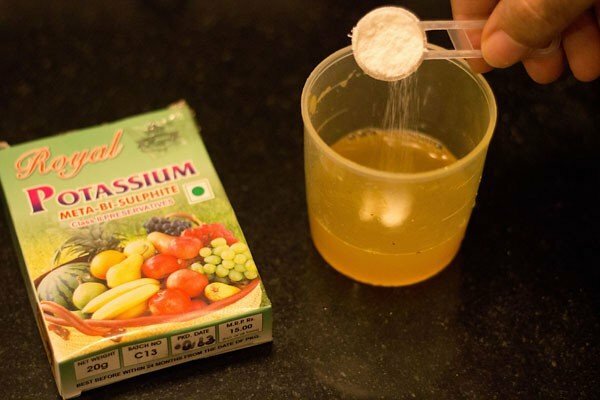 in the recipe i have used potassium metabisulphite. Chill orange squash – best way to beat the heat. Can we use any other preservative? Dr.kamal, I do not know about any other preservative. 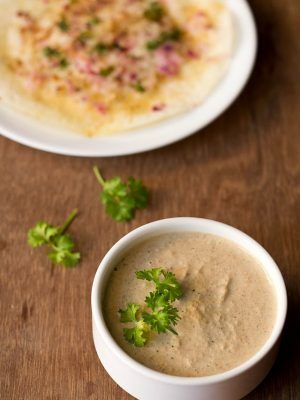 I have tried lot of recepies from yr website n it has always come out well. I have a question. I live in Bangalore n wanted to know where can I get organic unrefined cane sugar? you can buy from the organic section in any super store or in any organic store. in bangalore organic unrefined cane sugar will be easily available. 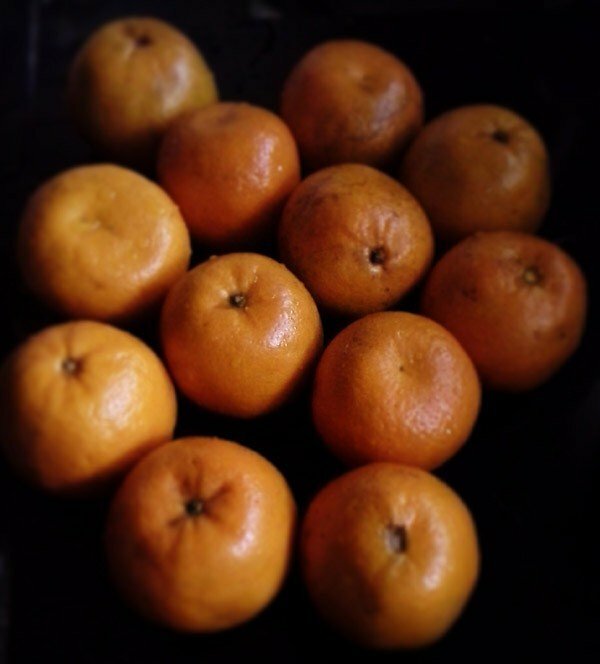 carol, sourness could be due to the sourness in the oranges. there is not much that can be done now. what i suggest is add 1 to 2 teaspoons of sugar when you dissolve the squash with water, while serving. if seeds are there, then the squash becomes bitter and not sour. welcome carol. Love it and I wan to taste every dish of that. 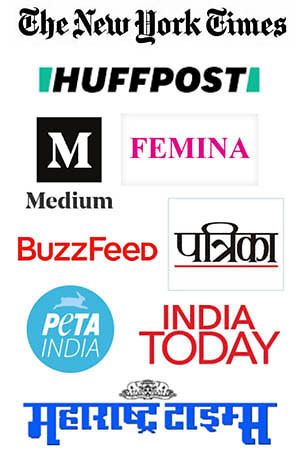 hai iam a regular follower of your blog. 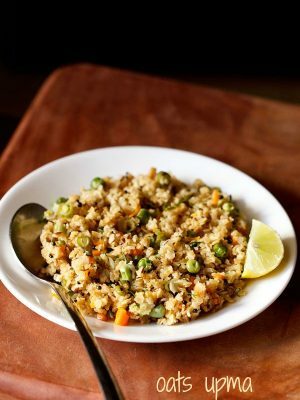 Your receipes with photos make cooking very easy and interesting……. 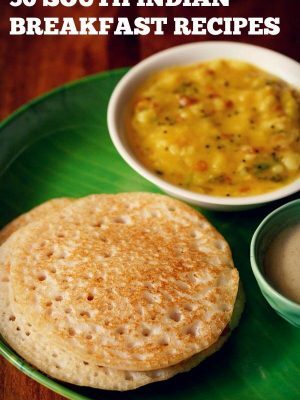 I just want to know that where can i get the preservative i live in hyderabad. 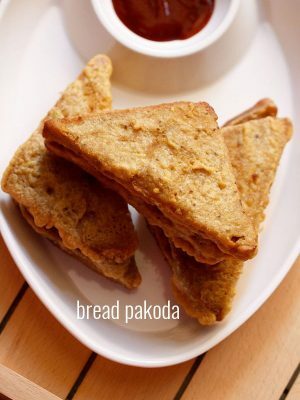 I did not find this preservative in online so, please let me know where can i get this……………..